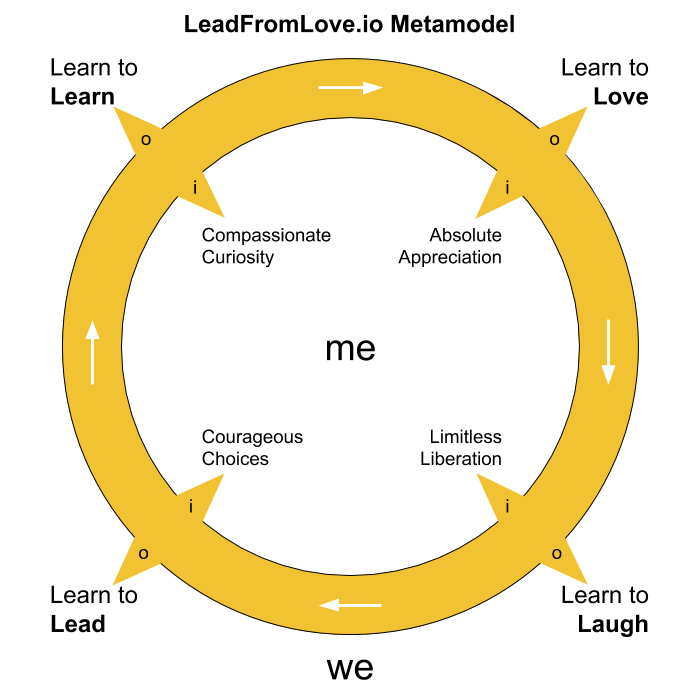 We begin with Metamodel Movement 1: Learn to Learn, which embodies compassionate curiosity. First you Learn to Learn about yourself, then Learn to Learn about the world. In this post, I’ll explain my vision for Movement 1: Learn to Learn. The remaining three movements will be covered in subsequent posts. For background on the Metamodel, please read the Metamodel Introduction. I believe that every moment of life provides an opportunity to learn, and it’s our choice whether we choose to learn or react in some other way. Learn to Learn starts with choosing to learn about oneself. All the power you have came from what you learned. We started learning the day we were born and have been learning ever since. We begin by accepting that we are always adapting and working to understand why we think, feel and behave the way we do. We then move to the outer circle to learn about the world beyond ourselves. As we pass around this circle throughout life, we will inevitably learn about ourselves as a reflection of the world, and the world as a reflection of ourselves. We are reflections of what we choose to see in the world. We can choose to see the world with curiosity and an open mind or a fixed perspective and a closed mind. Curiosity is a fundamental human trait. It’s at the root of all discoveries in all disciplines and industries. The questions of why and what’s next drive us to goodness, such as developing a cure for polio. However, pure curiosity has also driven us to considerable evils, such as answering the question, “how much much torture can a person stand?” This is why we must condition our curiosity with an equal dose of compassion. Learning requires us to maintain open eyes and hearts, and the most important lessons are the hardest to admit. Take war and genocide, for instance. If we don’t face them, we’re doomed to repeat them. You can learn something new anywhere. You can learn 10 new things walking down the same street 10 times. This idea is especially powerful when applied to ourselves. We can learn something new about ourselves every day. It takes a bit of practice to put ourselves in this playful, experimental and non-judgmental mindset. But once we’re there, the whole world looks different. New possibilities and relationships emerge. And from those, whole new opportunities can exist. If we remain fixed in one perspective, or story, for too long, we may lose our sense of curiosity. This is the death of growth and empathy. We must find a way to stay open to new ideas and states of being. We can condition ourselves to appreciate each incredible opportunity to learn, and also the opportunity to unlearn what we knew before when it’s clear that knowledge no longer serves us. This state of beginner’s mind can be beautifully innocent or ignorantly destructive based on how we embrace it. This doesn’t mean we must always be learning, which would be exhausting. But we must always remain open to the possibility that another perspective may prove valuable. Our minds often resist this idea since it’s much easier to accept a fixed worldview than embrace ideas that may undermine what we think we know. However, changing our perspective ultimately benefits us too, and may be as simple as standing on a chair to get another view. It can be frightening to imagine billions of different perspectives being just as valid as our own. Yet each is unique and powerful, just waiting to be unleashed. Learning requires humility. The process of learning includes knowing more at each stage of growth, which compounds as each body of knowledge becomes the foundation for the next stage of learning. People often close themselves off from learning by believing they have reached the end of learning rather than the beginning of another stage, like the end of high school or college. It’s not just about a constant desire to know more and more. Each inquiry’s conclusion opens the door to a new question. Curious questions are the gateway to all discovery and wisdom. True learning is awkward and often circuitous. We’re typically not good at something when we try it for the first time, which is best met with playful laughter than self-judgment. Play is one of the best ways to learn about ourselves and others. Play is at the heart of the most cunning innovation and the deepest relationships. Curiosity is the essence of play, which goes hand in hand with vulnerability, since play opens us up to that first awkward and exciting step into something new. Even a seasoned master can practice returning to a state of play in order to learn something new. One of the challenges with learning is when we believe that we paid for someone else’s lesson without agreeing to it, which can lead to resentment in a closed mind. For example, if a novice driver smashes into another car that was stopped at a stop light, the person on the receiving end could take the reasonable perspective that they have in some way paid for someone else to learn a lesson. Even if there was no bodily harm or out-of-pocket expense, there is still time and hassle involved. Yet there is something for both drivers to learn. I believe that we all participate in a cycle of learning from which we can benefit if we remain open to the lesson. By focusing on what we alone learn from an experience, we can avoid the distraction of blaming others and ruminating on what might have been. Compassionate curiosity also means having compassion for yourself to make decisions about what draws your curious attention. You could just spend your life endlessly wandering about in awe of everything, but that wouldn’t leave much time for what you’re meant to accomplish. A curious heart is open to learning, awareness, evolution and creativity. It looks beyond judgment and fear to make room for appreciation. This lays the stable foundation for practicing with patience and trust, which is how we grow into mastery with any endeavor. Life is not a rehearsal, yet you are what you practice. 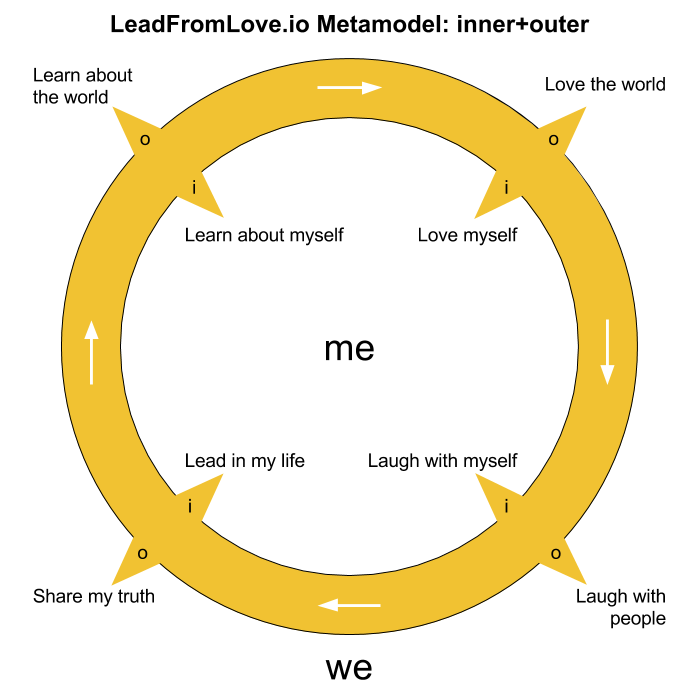 So far we’ve seen how the Metamodel is organized and explored Movement 1: Learn to Learn. Next time I’ll explain Movement 2: Learn to Love, which provides purpose at the heart of life.